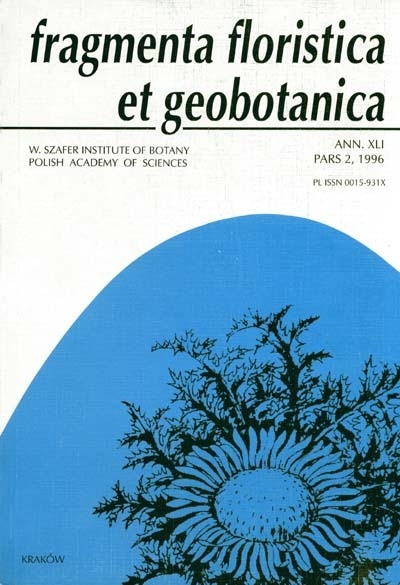 First All-Polish Scientific Meeting "Taxonomy, karyology and distribution of grasses in Poland", Kraków, 15 November 1994 – foreword. Studies on the variability of common wild oat (Avena fatua, Poaceae) in north-eastern Poland. Bristle-grasses (Setaria, Poaceae) in Poland. Vernal-grasses (Anthoxanthum, Poaceae) in Poland. Taxonomy, cytogenetics and phylogenetic relationships in the Lolium-Festuca complex (Poaceae): I. Lolium – a review. Chemotaxonomy of the genus Trisetum (Poaceae) in Poland. The genus Dactylis (Poaceae) in Poland in relation to Eurasian distribution. Chorological-ecological model of the spread of Puccinellia distans (Poaceae) in Central Europe. Embryo morphology in the genus Bromus (Poaceae). Interspecies differentiation of Bromus hordeaceus (Poaceae) in Poland. Morphological, anatomical and geographical characteristics of Eragrostis cilianensis (Poaceae). Dactylis glomerata subsp. glomerata (Poaceae) in Poland. Distribution of Glyceria declinata and G. pedicellata (Poaceae) in middle-eastern Poland. Distribution of Festuca amethystina subsp. ritschlii (Poaceae) in Poland. Hierochloë australis (Poaceae) in Nizina Mazowiecko-Podlaska (E Poland). Localities and habitat conditions of Hierochloë odorata (Poaceae) in the lower Bug and middle Vistula valleys. The state of conservation of the Scolochloa festucacea (Poaceae) population in Pojezierze Gnieźnieńskie (N Poland). Synthése taxonomique des Dioscorea (Dioscoreaceae) d'Afrique centrale (Congo, Zaire, Rwanda, Burundi). 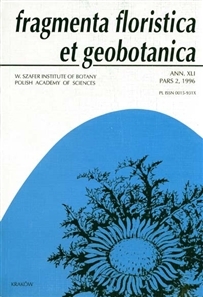 Synthése écologique des Dioscorea (Dioscoreaceae) en Afrique centrale (Congo, Zaire, Rwanda, Burundi). The vegetation of rice fields in North Korea and its relation to South Korea and Japan. Diatom communities occurring in Niebieskie Źródła near Tomaszów Mazowiecki, Central Poland (1963–1990). Tipo de dispersión, germinación y crecimiento de plántulas de Sagittaria latifolia (Alismataceae). Aérophytologie comparée de deux milieux urbains de l'hémisphére nord (Montréal et banlieue parisienne). Spatial differentiation of the field layer in relation to soil pH in selected forest communities. Ochyrella (Orchidaceae, Stenorrhynchidinae), a new genus from South America. Notes on Helonoma (Orchidaceae, Spiranthinae), with a description of a new species from Venezuela. Habitat conditions of the phytocoenoses of Nupharetum pumili in Poland. Distribution of bryophytes in various urban-use complexes of Szczecin (NW Poland). Lichenicolous fungi from the Polish Tatra Mountains. The spread and habitats of Eragrostis pilosa (Poaceae) in the Vistula valley. A community with Elatine alsinastrum (Elatinaceae) in the neighbourhood of Chojna in West Pomerania (NW Poland). Taxonomic studies on some taxa of the genus Linaria (Scrophulariaceae) from Pamiro-Alai. Chromosome numbers in selected species of Hieracium (Asteraceae) in the Sudeten and Western and Ukrainian Eastern Carpathians. The relationships between vegetation, geology and spectral response: a quantititative approach on the European beech (Fagus sylvatica, Fagaceae). Pollen–pistil interactions in Paspalum distichum (Poaceae). Distribution of Alisma gramineum (Alismataceae) in Poland. Distribution of Pleuridium palustre (Musci, Ditrichaceae) in Poland. A new locality for Octodiceras fontanum (Musci, Fissidentaceae) in West Pomerania and a review of its distribution in Poland. A brief historical survey of moss studies in the Russian Arctic. Studies on Spirantheae (Orchidaceae): I. Varia. Liverworts of the Bieszczady Zachodnie Range (Polish Eastern Carpathians) – a vanishing relict boreal flora. Representatives of the Veronica hederifolia group (Scrophulariaceae) in Poland. Distribution and habitats of Sanguisorba minor and S. muricata (Rosaceae) in Poland. Bellardiochloa violacea (Poaceae) and its status in the flora of Poland. Racomitrium curiosissimum (Musci, Grimmiaceae), an exquisite new species from New Zealand. Antipodal mosses: VI. Stegonia latifolia (Musci, Pottiaceae) in the Antarctic. A major range extension of Racomitrium lamprocarpum (Musci, Grimmiaceae) in South America. Drepanocladus polycarpos (Musci, Amblystegiaceae), an addition to the moss flora of Tierra del Fuego. Nomenclatural changes in South American and sub-Antarctic mosses. One more synonym of Holodontium strictum (Musci, Seligeriaceae). The southernmost locality for Limprichtia revolvens (Musci, Amblystegiaceae). The first record of Warnstorfia trichophylla (Musci, Amblystegiaceae) from outside the Holarctic. Rhizoid gemmae in Ditrichum brotherusii (Musci, Ditrichaceae) from Antarctica. Triceratostris (Orchidaceae, Spiranthinae), a new genus from Mexico. Seligeria brevifolia (Musci, Seligeriaceae) new to the Carpathians. The second discovery of Chaetomnion pyriferum (Chaetophorales, Chlorophyceae). Verrucaria velutinoides (Lichenes, Verrucariaceae) near Toruń in N Poland. Bruckenthalia spiculifolia (Ericaceae) found in Eastern Beskydy in the Eastern Carpathians. New combination in Helianthopsis (Asteraceae, Heliantheae). Nomenclatural notes on mosses: 12. A correct name for a variety of Rhacocarpus inermis (Rhacocarpaceae). Nomenclatural notes on mosses: 13. Cleistocarpidium, genus novum (Ditrichaceae).